do te like the Barbie diaries? Which Raquelle do te think is ruder to Barbie? la scelta dei fan: Raquelle from The Barbie Diaries! 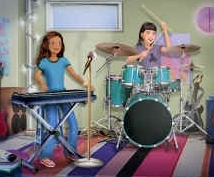 After Barbie, Tia and Courtney have band practice, they go to a spiaggia with their friend Kevin, who loves to make films. It is the last giorno before their sophomore anno at high school begins, so, at sunset, they each make a wish for the new school year: Barbie wishes to anchor the school news channel; Courtney wishes to improve her drumming; and Tia wishes to be class president, but Kevin refuses to say his wish out loud. The successivo day, Barbie drives to school with Courtney and Tia, but her ex-best friend Raquelle steals their parking space. Will te really be my sweetheart? o will we walk away as friends? Our personal Wiki and BD's articolo on it. a comment was made to the poll: Battle between popularity and beauty: Raquel o Barbie?